Pretty horrible, isn’t it? It’s creepy and disturbing, and I wondered how many parents and teachers refused to read it to children based on the first three or four pages. I had doubts about letting my own kids read it, but I pressed on, knowing this book won the Newbery in 2009. There had to be something to that, didn’t there? Yup, there’s something to that all right. The killer does not find the baby. The child, a climber, has crawled out of his crib, bumped his way downstairs, and, finding the door open, toddles off into the night. He ends up at a graveyard, and the dead, seeing what is about to happen to the pursued child, intervene. Then they name the child Nobody (Bod for short) and decide to raise him as their own. Yes, it takes a graveyard to raise a child. There are ghosts, ghouls, hellhounds, night-gaunts, a barrow, a witch, and a vampire in this book, and that, too, might be off-putting to adults, yet I assure you they’re pretty innocent. These creatures are not evil as we think of them. (Well, the ghouls are nasty, but they’re chased away.) There are no occultic themes. These are simply Bod’s neighbors, and a very original neighborhood it is. 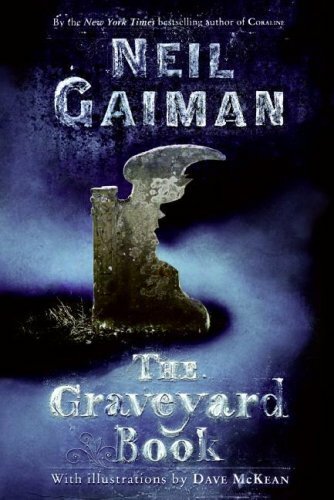 The dead of an English graveyard actually give Mr. Gaiman a wealth of material to work with. The neighbors come from all time periods, use all manner of old speech, dress in period-appropriate clothing, and even teach Bod all they know of the world, which is kind of funny, because they have no idea about cell phones and such. In fact, Bod gets an old-fashioned lesson about “Elements and Humours” at one point. And two ghosts from totally different time periods have begun “stepping out together.” (“The couple seemed to have no troubles with the differences in their historical periods.”) Mr. Gaiman’s humor, a bit macabre though it might be, gives plenty of winks all the way through. I actually enjoyed this book a good deal. Since the first scene of the book is pretty awful, and since it does involve the dead, parents might want to preview The Graveyard Book on their own, but I found it pretty harmless. I’d give it a 12+ age rating. The shocking first three pages are definitely the worst moment in the book. The overall message is actually quite positive, however. You see, Bod comes of age in the graveyard. He grows, he matures, he changes. The dead stay exactly the same. And it is they who encourage him to live before he joins them. “Do you know what you’re going to do now?” his dead mother asks Bod at the end of the book. Exactly! You can always put it down if you don’t like it. For middle school, this is just perfect, but I would be concerned about third or fourth graders picking it up. I totally agree. That’s right on with my 12+ rating. This is one of my favorite books of all time. I fell in love from the very first line. The one with the hand holding a knife? I wish I still had the book to do a proper quoting. Hi Akoss! I enjoyed it, too, though I didn’t think I would. It was different from anything I ever read before, and I loved Mr. Gaiman’s subtle humor. This book fascinated me from the moment I read it (and that was before it won the Newbery). I remember trying to guess the Newbery that year, and it never occurred to me to suggest this book. I just didn’t find it to be Newbery material — probably because of that off-putting opener! But I loved it. I loved the idea that family can be as different as ghosts in a graveyard, and still be supportive and loving. I believe I read somewhere (and it might have been on an MMGM blog) that Neil Gaiman said this was the only book he wrote that turned out better on the page than the book in his head. It was a Newbery surprise! That’s an interesting bit about Neil’s opinion. Thanks, Joanne.